Let us once again reflect on the beauty that comes with limitation. These blocky renderings of world-famous superhero characters manage to convey just what works about each character design, despite the lack of detail that Cyclops, Superman or Spider-Man are usually drawn with. And they leave you craving the next logical step, which would be to see how they'd animate and feel in an actual game. For me, the Superman and Spider-Man drawings bring back memories of those characters' Atari 2600 games. Looking back, it's amazing how simple alternating pixels made you believe that Kal-El was zooming through the sky or the wall-crawler was dodging the Green Goblin's pumpkin bombs. Of course, players' own hungry imaginations helped. 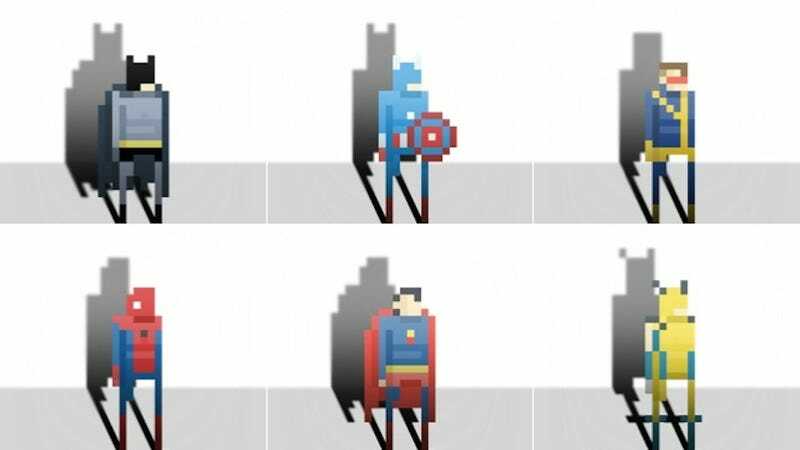 And it's that quality–the imagination of artist Ercan Akkaya–that makes these pixel heroes so cool. Head over to Akkaya's site to see the full set.